Wood is one of the few genuinely renewable building materials produced in South Africa from trees that are grown in sustainably managed forestry plantations. Once the trees are harvested, new seedlings are planted to replace them, thus ensuring a continuous and sustainable flow of raw material into the future. Wood can also be re-used for other projects once its original purpose has been served. Wooden structures can be erected with less impact on the surroundings, since lighter weight construction machinery, equipment and tools are used. It is also easier to build in more difficult to reach locations due to the flexibility of using wood products. The "Carbon Footprint" of a product or activity is a measurement of the total amount of greenhouse gas emissions released into the environment from that product or activity over a given period of time. Greenhouse gas emissions from all sources are consolidated and changed into units of CO2 equivalent, which are used to standardise the measurement of greenhouse gas emissions and help make comparisons between different products and industries over time. Carbon emissions are usually measured in metric tons per year. Of all mainstream building products, wood scores the lowest in terms of its carbon footprint impact. global warming – referred to as the "Carbon Cycle". Basically this is a chemical process whereby carbon dioxide is turned into an organic state (carbon) and "stored" in a tree's tissue until at some future stage, through processes such as combustion or rotting, it is released back into the atmosphere as CO2. 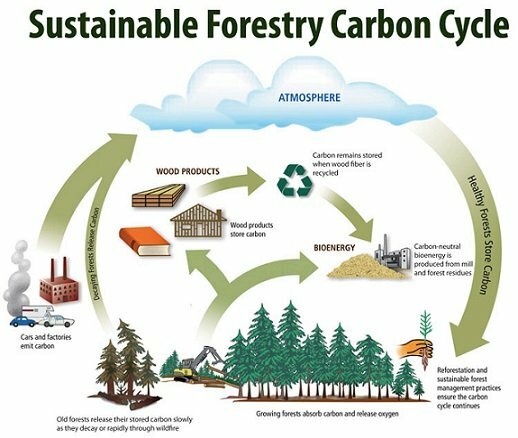 In the case of wood products, the carbon cycle could best be explained as follows. Growing forests (trees) absorb carbon dioxide (CO2) as they grow, thereby creating a "carbon sink", whilst simultaneously producing oxygen (O2), which is released into the atmosphere. Mature trees are harvested and processed by mills into sawn timber (lumber), wood chips, fibre for paper pulp, often using up to 75% of the required energy needed in the conversion process from renewable energy sources such as sawdust and off-cuts. The output of these mills is then manufactured into a whole range of products. Sawn timber is further manufactured into roof trusses, cable drums, pallets, structural timber for construction purposes and furniture. Compressed wood chips and fibre are turned into timber board products such as chipboard and medium density fibreboard (MDF). Pulp is used to produce various paper and packaging products. All these production processes provide yet another carbon sink. Once a wood product has reached the end of its useful life in one application, it is often recycled for secondary material, thereby extending the carbon sink process even further. Finally, energy can be produced from the waste wood products, thereby substituting for fossil fuels. However, industry and vehicle pollution continue to create more CO2 , which is in turn absorbed, by the growing forests (which have been replanted) and the carbon cycle repeats itself. Hence, wood from sustainable plantations can in fact be better than carbon neutral. In fact, research has shown that wood is the only mainstream building material, which, during its production, actually has a net impact of absorbing CO2 from the atmosphere rather than emitting it. It has been calculated that no less than 1.7 tons of CO2 is absorbed, net of all the energy used in the growing, harvesting, transporting and processing of 1 ton of wood. By comparison, concrete production releases 159kgs of CO2 into the atmosphere, steel, 1 240kgs and aluminium, a massive 9 300kgs. These properties mean that the higher the proportion of wood used in the construction of a building, the lower its carbon footprint. For every cubic metre of sawn timber used instead of other building material around a ton of CO2 is saved from being released into the atmosphere. For example, 3 tons of CO2 can be saved from the 20-ton footprint of a typical traditionally built brick and mortar 3-bedroom house by using timber framing. Furthermore, should timber be substituted wherever possible, including the use of softwood exterior cladding, an additional 14.6 tons of CO2 can be saved, resulting in a footprint of a mere 2.4 tons – a total reduction of 17.6 tons! If you use enough wood, a building can be carbon neutral or better. In assessing the environmental impact of wood as a building material, it is necessary to look at the concept of embodied energy and review how wood compares to other building materials. Embodied energy refers to the total amount of energy used to fabricate particular building materials from raw material to installation and is measured in Mega Joules (MJ) per weight or area. Wood scores the most favourably compared to other building materials. International research has shown that on average a ton of bricks requires 4 times the amount of energy to produce than a ton of sawn timber, concrete 5 times, glass 6 times, steel 25 times, and aluminium, a whopping 126 times more. Apart from low embodied energy, wood structures have low lifetime (or operational) energy usage compared to other materials. This is largely due to woods’ inherent thermal insulation properties. With the pending energy efficiency codes, timber will have a major advantage, as mentioned above. Energy efficiency entails making sure that the minimum amount of energy is used to heat or cool a building over its lifetime. Wood in its own right is natural insulating material, but when combined with other materials such as fibre or foil insulation, can optimise the thermal comfort for the building’s inhabitants. Wood is a natural insulation element. Timber provides comparatively good insulation against noise, temperature and electricity. Wood has the best thermal insulation properties of any mainstream construction material. Wood is 5 times better than concrete, 10 times better than brick and 350 times better than steel. A wood structure will last just as long as a brick and mortar building – after all there are thousands of timber buildings in Europe, which have been around for many centuries. In actual fact, the oldest wooden building in the world is the Temple of the Flourishing Law, a Buddhist Temple, situated in Japan, which, dating back to AD607 is just over 1 400 years old. The treatment of timber prolongs its life even further in providing protection against fungal decay, termites and borers. Trees are wonderful plants - they not only provide enormous environmental benefits which, amongst others, help to mitigate the effects of global warming and produce life giving oxygen - they provide us with wood. Wood is not only aesthetically pleasing, it is the only true renewable building material and has inherent physical properties and characteristics which, by any measure, make it the most versatile and environmentally friendly building material that exists. This item has 1109 views.